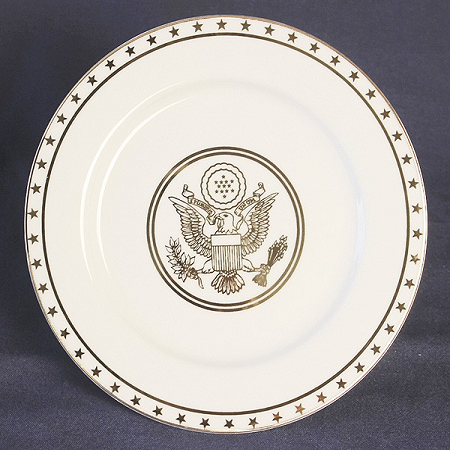 Great Seal Luncheon Plate: The American bald eagle is the most prominent feature of the Seal of the United States. The seal represents our desire for peace but our willingness to defend. 13 Stripes across the breast of the eagle represents 13 original states. Great Seal Luncheon Plate is 7 1/2-inch and is decorated in 24 kt gold. Also it has been decorated with star which is so prevelant in the architecture of the U.S. Capitol.